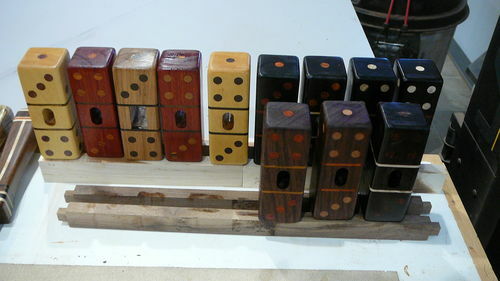 The heads started out as 2×2x12 (African Blackwood), 2×2x18 (Ebony and Yellowheart) and 3×3x12 (Bloodwood, East Indian Rosewood). After cleaning off the wax and squaring things up, the pieces were ripped to 1 7/8” squares. Since the Leigh M&T jig was already set up for the 1/2X1 mortise and tenons all i had to do was mark centers for the mortises that would receive the tenon on the handle. 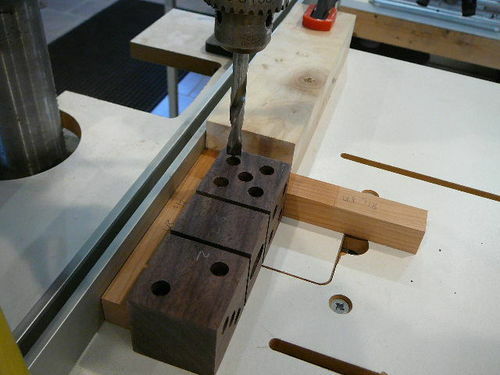 The handle tenons were cut first so hey can be checked for fit without taking the head blank out of the M&T jig. 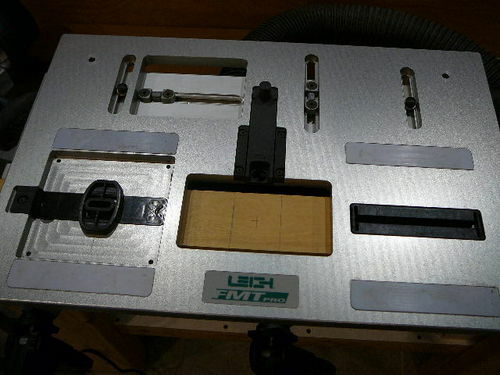 I also left the blanks long to work better with the hold downs on the jig. Short pieces like the heads (5 1/4”) are difficult to keep secure in the jig due to the work area opening. After each of the mortises was finished, I checked the fit with a couple of the handles. 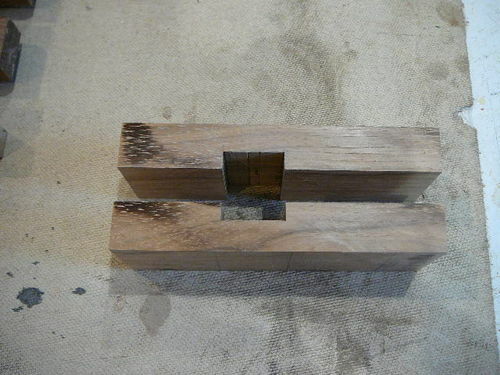 The blank was then flipped so the mortise for the second head could be cut. 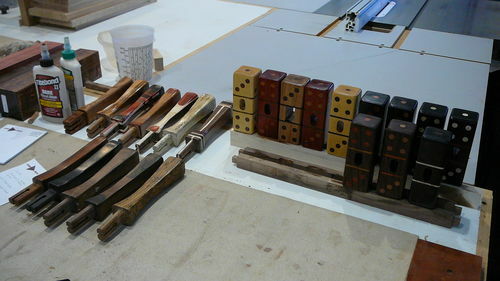 The blanks were cut to final length (5 1/4” which is 1 7/8” dice + 1 1/2” handle + 1 7/8” dice”). 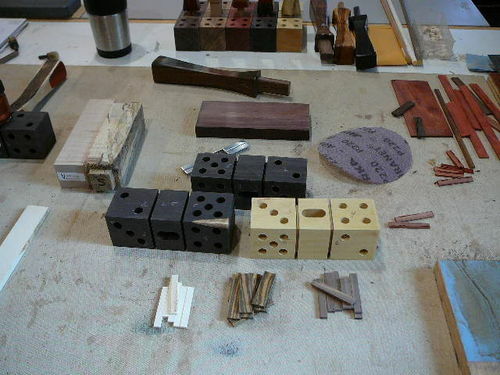 I also cut the 1/8” wide x 1/4” deep slots for the accent wood to define the edges of the dice. Center marks for the 3/8” pips were made for the different dice faces. I would recommend 5/16” rather than 3/8” as I had some cracks form between the pips when I put the plugs in. The holes were 3/8” deep but I would suggest that they only need to be 1/4” deep since they are decorative only. I used a set of spacers to index the holes in the corners without having to switch anything around. That way, at least things lined up even if they might be slightly off center. The set up was adjusted to accommodate the center hole. I wrote the number of pips on each face and lined up all of the heads the same way so I wouldn’t mess up and drill out the incorrect number of holes for a face. 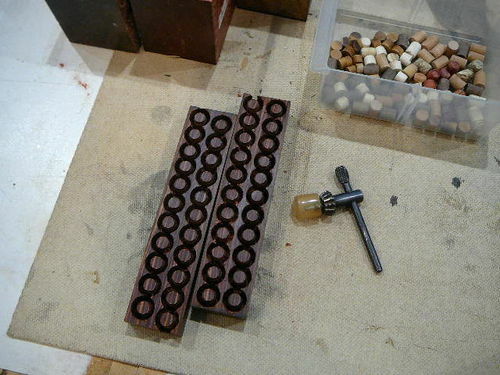 The pips were made from dowel stock and drilling out plugs. All of the plugs went through the dowel plate to make sure they were round and not over sized. 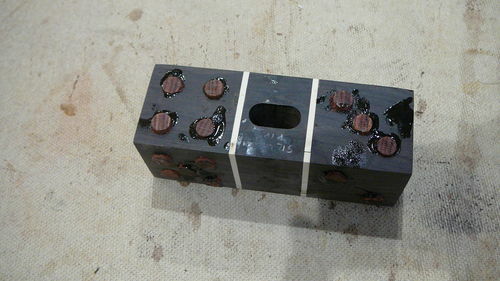 Plugs and inlay pieces were glued onto the heads. 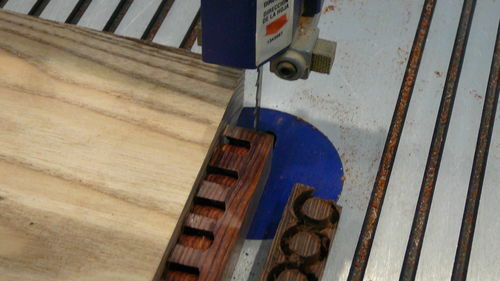 The walnut head was made using a different approach. 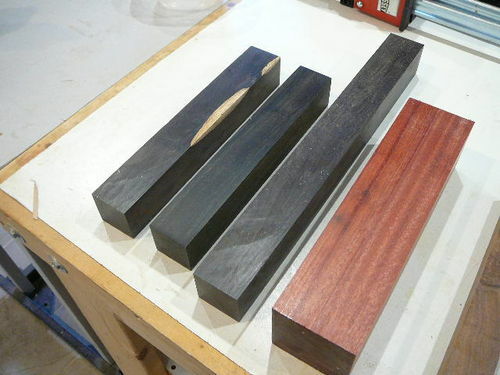 Blanks 1 7/8” wide, 5 1/4” and 15/16” thick were made. 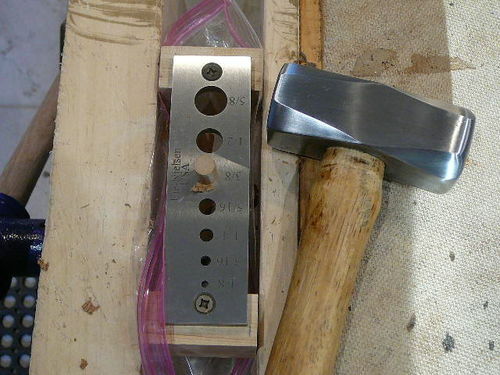 A dado stack on the table saw was used to make the mortise for the square handle tenon. 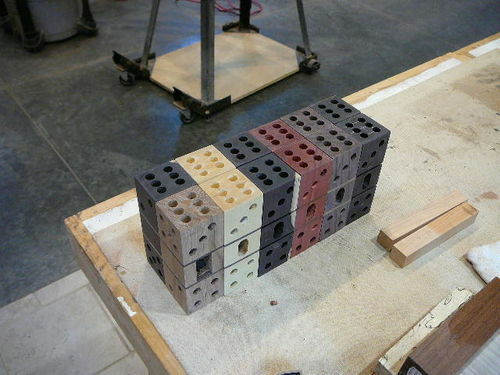 The pieces were glued together and the walnut head was completed in the same manner as the other ones. After sanding things flush and rounding over the edges the heads were prefinished using a coat of laquer sealer, then a coat Seal-A-Cell with 400 grit sanding between coats and then sanding to 2000 grit before applying Behlen’s Deluxing Compound. Rather than write about the "what" that is done to build a project I want to focus on the "how" and "why"of the project as I build a version of Kevin Rodel's Taliesin desk. 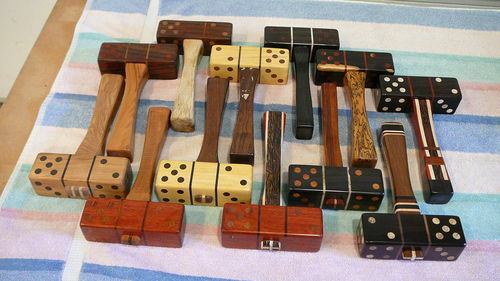 wow a lot of work earl but the results look well worth the effort.i guess from now on well call you the mallet man-lol. Nice work, Earl. The assembly line grinds along. Thankfully they are done sent out and the Tool Swap doesn’t start until tomorrow. Thanks for the blog – it was fun to follow along. I have heard the expression T$%d polishing but Lump hammer polishing, thats something different. I needed to put my sun glasses on to check out your post.! That is quite the process you had making those Earl. Really nice setup and execution! Excellent work Earl. Thanks for the write-up! I enjoyed seeing your process and the order of your operations. Rob – the hammer just needs a bit more use. It is still shiny and new from the mallet swap. It was made by KelleyCrafts.